Cardinal Greenways is a private, not-for-profit organization that encompasses the Cardinal Greenway, White River Greenway, Historic Wysor Street Depot and Cardinal Equestrian Trail. The Cardinal Greenway is the longest rail-trail in Indiana and spans 62 miles from Marion through Muncie to Richmond in East Central Indiana. Cardinal Greenways will span East Central Indiana. 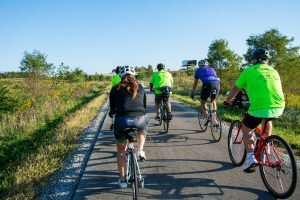 The trail system will be continuous, without breaks and will eventually link to trails in Illinois and Ohio. The system will be easy to reach, simple to navigate, and safe to use, with regular maintenance, sound security, and connections to community destinations along the route. As a public resource, Cardinal Greenways will offer education, wellness programs, environmental awareness, and recreation for a wide range of audiences. Cardinal Greenways is dedicated to enhancing the quality of life by developing and operating corridors and trails to connect people and communities. Have fun discovering the many Hoosier towns along the 62 miles of Cardinal Greenway. Each one is an interesting, unique part of East Central Indiana. Learn about Cardinal Greenways’ rails-to-trails story. It’s a fascinating journey from times gone by until the present. Enjoy the trails! Have a great experience and safe time on the greenways by acting properly and following safety guidelines. Ask us anything about Cardinal Greenways! We are eager to help. Send us your questions, concerns and comments.